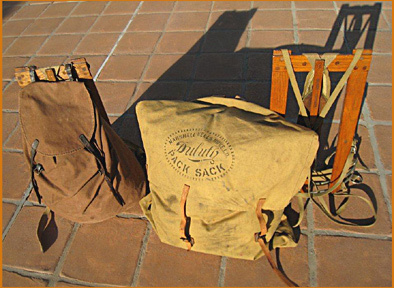 (images above): three 1920-era packs, all made or sold in Portland, Oregon--- a "Duluth" pack sold at famous Portland hardware store Marshall-Wells Hardware Co.; and two "Wy'Easter" brand packs, made in Portland (Wy'Easter also made ice axes). Image credit: Peter Ireland... 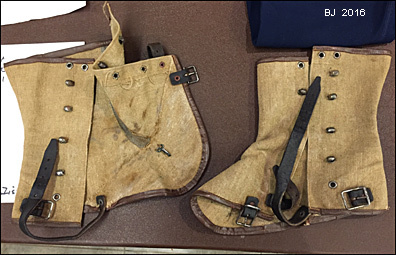 Image on right: a pair of gaitors from the early 1930s, which was before the invention of nylon. This was also a time in the history of gear before velcro, and a time when the only zippers available were made of metal. Images below are from the 1960 EUREKA TENT catalog, commemorating their being in business since 1895 and celebrating what was the company's best expeditionary tent design.... 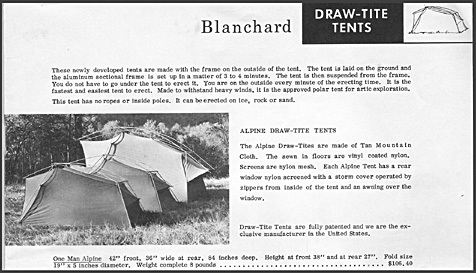 The ad copy states that this Blanchard Draw-Tite "Alpine" tent uses "Mountain Cloth" for its canopy. Unfortunately Eureka's vaunted "Mountain Cloth" was NOT some version of the same nylon fabrics then in use by the likes of Alice Holubar and Gerry Cunningham in their cutting-edge clothing designs of the 1950s. Nevertheless, Eureka is proud of this tent, saying "It is the approved polar tent for arctic exploration." These were fairly heavy tents due to the combination of "chrome aluminum" poles, and the 6.6oz. poplin (aka Mountain Cloth) canopies, and the vinyl-coated nylon floors. 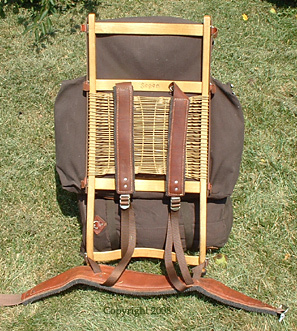 Even the one-man size of the Alpine weighed 8 pounds, while the two-man size weighed 12 1/2 pounds! Note: the Mountain Cloth was fairly waterproof by itself, and so no rainfly was supplied. In terms of History of Gear innovation, the Blanchard Draw-Tite tents were among the first to use a fully-external frame, which allowed the user to erect these tents without ever needing to get inside them; this frame also made the tent an early forerunner of the true self-supporting dome designs that were going to come along in the mid-1970s from The North Face and Snowlion...... Eureka's other innovative product in 1960 was NOT the Mountain Cloth that it bragged about in the tent ad copy--- it was a new fabric it had been working on for 18 months with DuPont. They named it "Polaris Cloth" (see second image below). Polaris Cloth, a 100% nylon fabric (weight per yard not listed), was only being introduced by Eureka in 1960, and was available only as a custom-order fabric. This was huge for such a big traditional tent company to step forward and transition itself into modern nylon fabrics. Hurrah for Eureka as a major outdoor supplier to lead the way so publicly. Please Note: All Material on this page, and in all my "History of Gear" webpages, is copyrighted, and no usage of my material is permitted unless explicit permission is granted by me, Bruce B. Johnson, owner of OregonPhotos.com. ... Editors: Please contact me if you have interest in publishing....Others: if you were involved with one of the old-line, vintage gear companies and have a story to tell in these pages, please contact me soon (oldgear@oregonphotos.com). That includes those who have stories about Oregon's Mountain Stores (see below)....Sponsors: if your outdoor company is interested in sponsoring this site, please contact me for details.